To create space for entertaining while allowing flow through the center of the house, Manganello replaced some of the seating with a banquette. The table can be pushed back against the banquette when it’s not needed. The kitchen’s oversized island is topped with extra-thick Danby marble and accommodates a farmhouse sink, storage shelves, and seating for casual meals. Elements recovered from the original structure include the diamond-paned window above the bar area and the pantry door, visible to the left of the kitchen. A stone fireplace provides a focal point for cozy gatherings in the sitting room. A second seating area for two is oriented to take advantage of the sea view. A wooden mermaid from Antiques on Nine in Kennebunk lounges behind the couch. 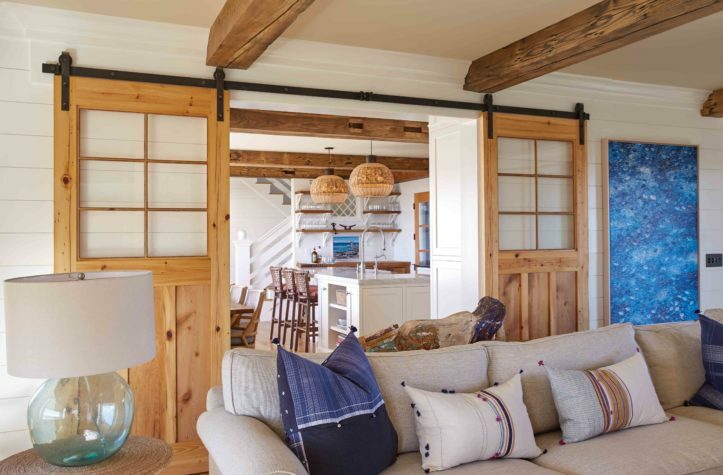 The homeowners reused beams, doors, and fixtures from the property’s original structure and worked with Henry Souza of Barn Removal Services in Massachusetts to find salvaged wood. Other elements came from their travels, including the Vietnamese painting in the sitting room: a school of fish rendered in striking blues. 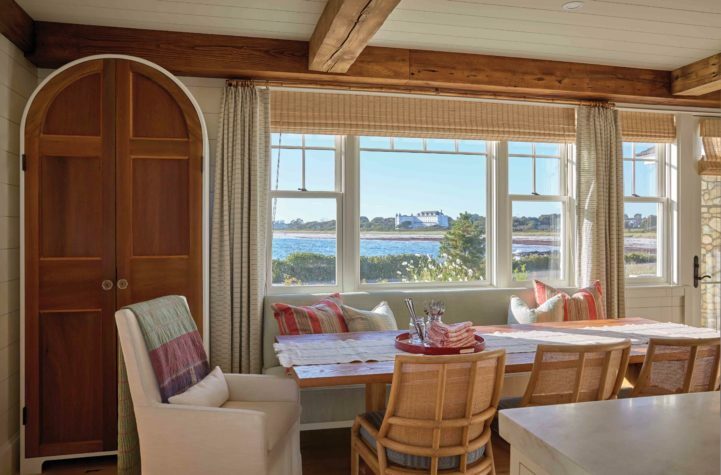 Interior designer Nicola Manganello worked with the homeowners to combine a Californian aesthetic she describes as “warm contemporary” with the New England vernacular. Throughout the home, white nickel-gap walls offer a cool, smooth backdrop for natural fibers and soft indigos. 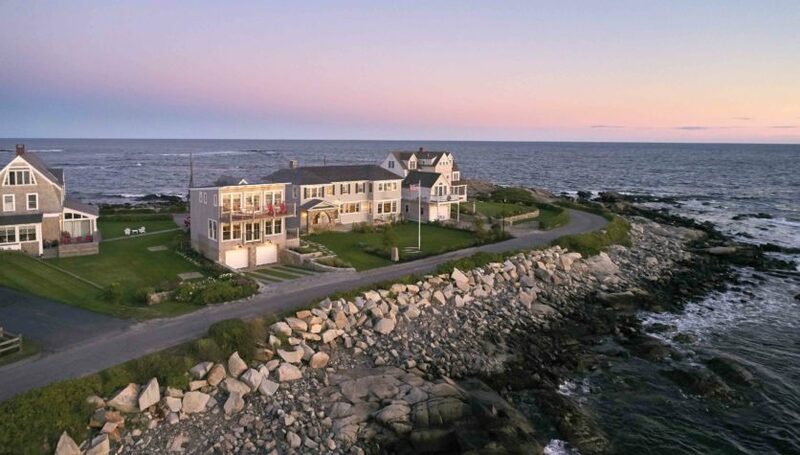 There aren’t many locations in Maine—or anywhere— that can rival a particular narrow spit on the southern coast, bounded on either side by dark ledges of water-worn rocks and bright tangles of beach roses. The wide-open sea stretches away on one side, while the other looks back over a small cove and sandy beach. Near the end of this spit is a small parcel of land that for many years held an old cottage and garage. When the homeowners decided to rebuild, they were committed to honoring the special character of the spot with a home that welcomes guests and family with a sense of place and history. Every element of the new build is characterized by modern design that respects history and minimizes waste while working within the tight confines of the site. Because shoreland zoning regulations allowed no more than a 30 percent increase in volume or square footage, the project was a “giant mathematical puzzle,” says the husband. Furthermore, the new home and guesthouse would have to stand up to coastal weather. Residential designer Erik Peterson of Peterson Design Group designed a pair of distinct but complementary buildings: a classically proportioned cedar-shingled main house with a flow-through foundation and a contemporary metal-framed guesthouse on the site of the old garage. 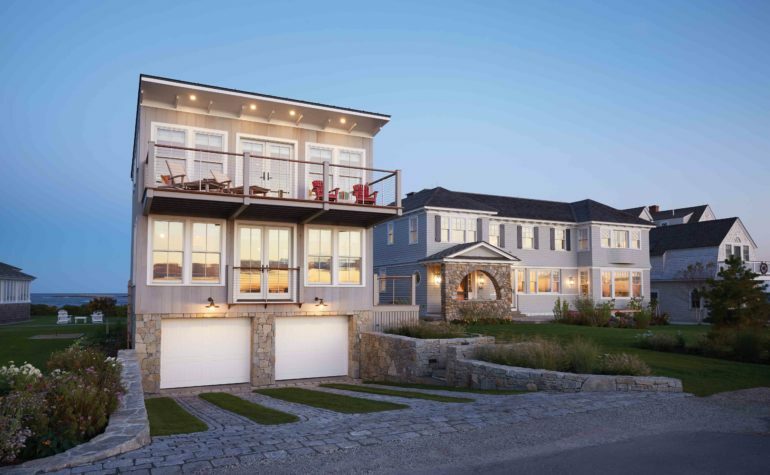 Andy Tripp of Kennebunkport’s Thomas and Lord managed the year-and-a-half-long project, coordinating with Nicola Manganello of Nicola’s Home in Yarmouth as well as with the homeowners. “It was fun to work collaboratively with them,” says Tripp of the homeowners, who sourced salvaged elements, from flooring to plumbing fixtures. “That stuff’s always more challenging than contemporary materials. But kudos to Nicola: she incorporated everything, and it looks great.” “It was a brand-new home, but they wanted it to feel timeless—to have the feeling of a well-traveled life. That’s something we specialize in,” says Manganello. Her company sources objects from European boutiques as well as local vendors to create a look that’s personal and warm. 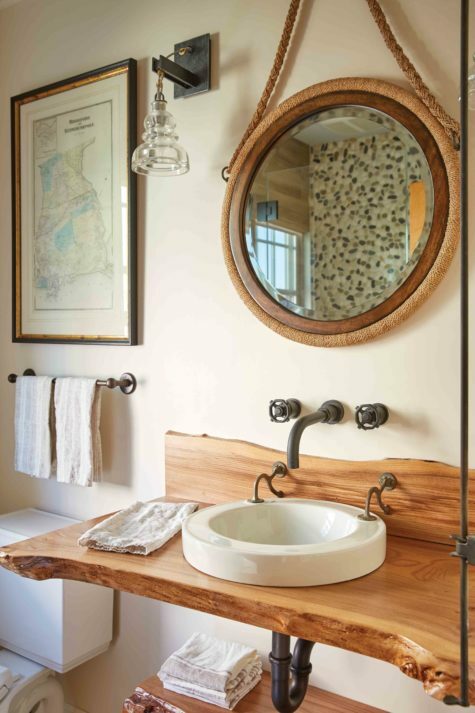 To complement the richly textured reclaimed wood that the homeowners found for flooring and beams, Manganello kept the walls light and neutral, covering most of them with white nickel-gap paneling. 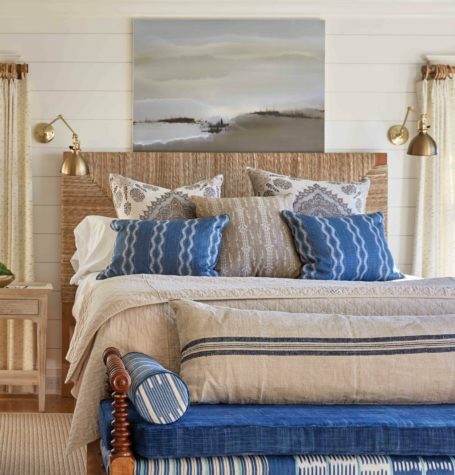 Throughout the house, she incorporated vintage textiles in shades of worn linen and soft indigo, which create a calm, lived-in feeling. 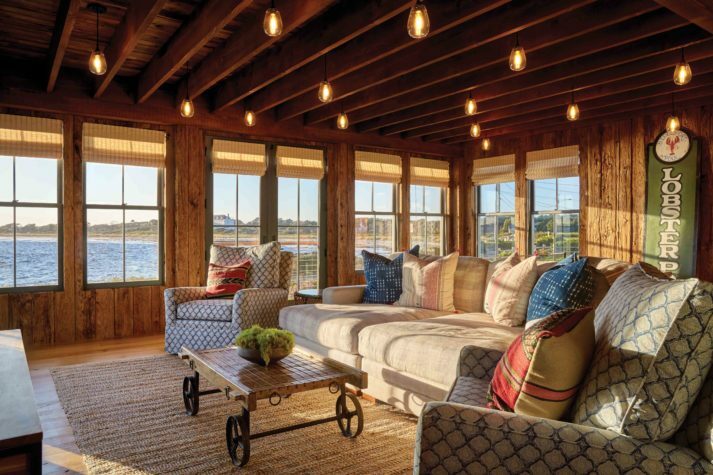 On the ocean side of the house Lenny Van Gaasbeek incorporated stones from the original chimney into a stone-fronted porch with a stone fireplace at one end. He also framed the back door with a stone arch that adds some grandeur to the entry that (this being Maine) will get the most use. The door opens to a friendly entryway lined with storage benches and hooks for hats and windbreakers. “They wanted a warm, welcoming feel for people with sandy feet,” says Manganello. From the mudroom a hallway leads to an accessible bathroom and cozy wood-paneled den, designed for the husband’s late brother, and a stairway leading to the three upstairs bedrooms. (There’s also, the husband tells me, a secret passage from the den to the kitchen, but I haven’t spotted it.) 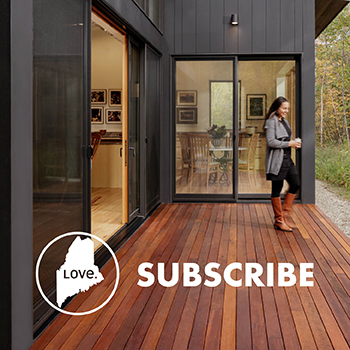 To the right of the entry, a nickel-gap wall follows an elegant curve into the kitchen. 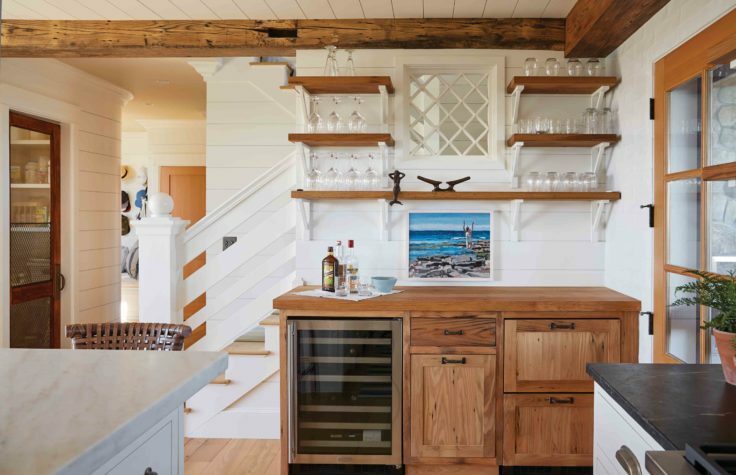 The cooking and dining space is bright and casual, with open shelves for dishes next to the stove and an oversized island that accommodates a farmhouse sink, shelving, and a quartet of vintage McGuire barstools. A bar area includes open shelves for glassware, a wine refrigerator, and, on the day I visit, growlers from local breweries displayed on either side of a large bronze cleat. Space constraints made it difficult to create an area where guests could sit down for dinner together. Manganello solved the problem with a banquette that allows the table to be pushed close to the wall when extra seating isn’t needed. When the stools and chairs are in place, the kitchen offers an open view of the stately stone fireplace that anchors the living area at the end of the house, where cozy couches encourage family gatherings around the fire. Manganello also configured a second sitting area with two chairs she covered in vintage indigo-dyed Chinese tapestry. It’s a perfect place to share a cocktail, looking out the broad windows toward the spectacular sea view. The guesthouse proved especially challenging to design and build. 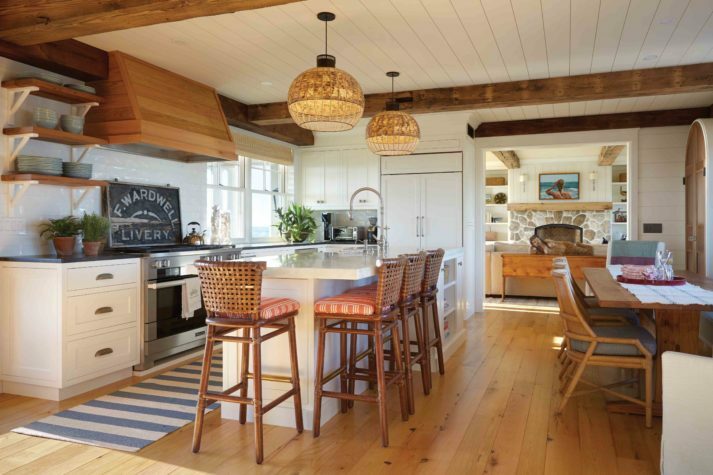 The second-story ceilings couldn’t be made high enough for comfort under a traditional pitched roof, so Peterson suggested a “modern fish shack” with a shed roof. This decision led to a much more contemporary design for the guesthouse that, in its early, metal-framed phases, drew skeptical looks from neighbors. Once clad in vertical planks of red cedar and visually tied to the main house with a foundation wall of gray and yellow stone, however, it began to attract compliments instead. The guest suite on the second story feels spacious, modern, and bright, with an ipê deck extending the view-enjoying opportunities. Below, the mood is different: dimmer, cozier, and more playful. A Ping-Pong table and TV area are lit by Edison bulbs randomly placed around the ceiling, which is made of chestnut sourced from an old whiskey barrel factory. The walls are covered in a dark, deeply textured wood from tables once used for growing mushrooms. Acid from the mushrooms made the old tables unusable for their original purpose, but also etched unique grooves and patterns that revealed themselves after a power wash in the parking lots at Thomas and Lord’s shop. The two modest-sized buildings on their small lot nonetheless cover a remarkable amount of ground, with styles from classic to contemporary, materials and objects from around the world and close to home, and hundred-year-old boards and beams starting a second life in a brand-new dwelling. The total impression of all this range, however, is harmony. The project’s varied inspirations and careful collaborations have created a place where family and friends—old and young, near and far, familiar and new—can all settle comfortably together, gathered in a home that’s just beginning. 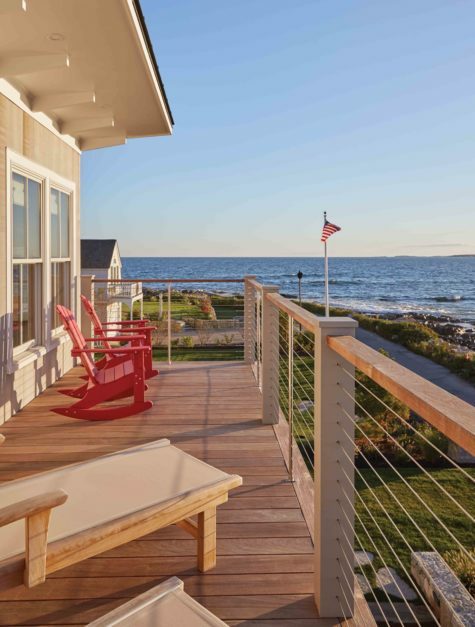 The guesthouse’s second-story deck looks out toward the nearby beach, offering sunset views. 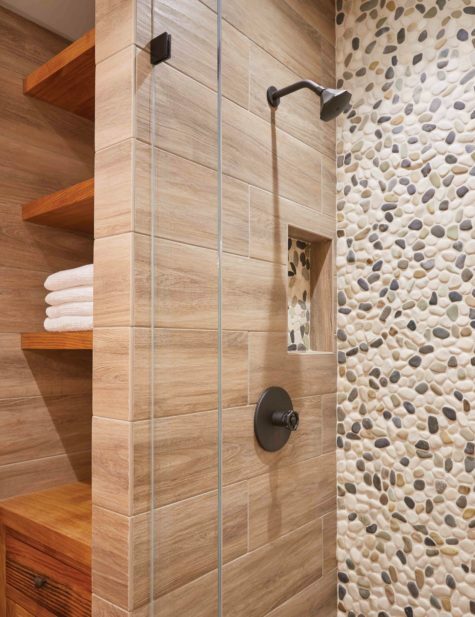 The home’s juxtaposition of warm wood and weathered stone is repeated in the bath. Designing the guesthouse with a shed roof allowed the second-floor guest suite to be spacious and airy despite height restrictions. Mark Welch & Son, Inc.